Happy Book Birthday to THE TURTLE SHIP! 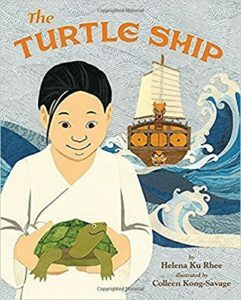 Colleen Kong-Savage’s (illustrator) debut picture book THE TURTLE SHIP by Helena Ku Rhee published today with Lee & Low to some nice reviews! Long ago in Korea, a young boy named Sun-sin spent his days playing with his pet turtle Gobugi and dreaming of sailing around the world. As a poor villager, though, his dream to travel seemed impossible. Then one day, the king s court announced a contest to find the best design for a new battleship to defend the land from invaders. The winner would sail the ocean with the royal navy. Determined to win, Sun-sin attempts to build an indestructible battleship with a few found items. Each attempt fails miserably against the powerful sea, and with it Sun-sin s dream also sinks to the bottom. Turning to Gobugi for comfort, Sun-sin notices how his pet turtle is small but mighty, slow but steady, and impossible to sink. Suddenly, Sun-sin has a great idea. Loosely based on the true story of Admiral Yi Sun-sin and his Turtle Ship, this delightful tale by debut author Helena Ku Rhee and debut illustrator Colleen Kong-Savage introduce young readers to a fascinating episode in Korean history and naval engineering. Colleen Kong-Savage is a full-time illustrator and graphic artist. When she first moved to New York City, Kong-Savage worked at an art supply store, where she spent half her paycheck on decorative papers. For this debut picture book, she spent countless hours researching the clothes, living conditions, and landscape of the Joseon Dynasty, and then finding the right paper for each item. The papers used in this book come from around the world, including Korea where traditional paper is handmade from mulberry bark. Kong-Savage lives in New York City. Helena Ku Rhee is a children’s book writer by night and works full-time at a movie studio by day. Born in South Korea, she grew up listening to mighty tales of the Turtle Ship and Admiral Yi Sun-sin from her parents and grandparents. This is her picture book debut. She lives in Los Angeles with her family. You can find her online at helenakrhee.com. You can pick up a copy at Amazon, Barnes & Noble, IndieBound, Lee & Low, Target and your local bookstore! You can follow Colleen on Instagram, Twitter and go to her website!